I created this exercise video for me. I hate to listen to exercise gurus talking while I exercise. All I wanted was to be able to run on the treadmill and imagine that I was walking on a beach or running through the woods or strolling through a botanical garden. I just wanted something that would be quiet and let me enjoy the walk on my treadmill and a little pretty scenery on the way. Last time we were in California, I took my friend’s video camera and walked along the beach for over 45 minutes. The result is a new kind of exercise video for me and you to enjoy. It’s a quiet walk along the beach. All you hear is the ambient noises of the area. There is no coach talking over the sound of the waves. It’s just you, the water, the wind and the sea birds. This video is only a minute and a half, but it gives you an idea of what you will see. I want this DVD to get out to as many people as possible, so I’m selling them for $5 plus shipping. If you workout with it once, it’s totally worth the price. If you enjoy it twice, then I’ve completed my mission. I love this video and have worked out with it several times. Mike, however, didn’t like it and stopped it five minutes into the video. I gave it to a few people to test, hopefully they will comment on what they liked and didn’t like here so you can hear it straight from their mouths. The DVD is 49:13 minutes long and will be shipped via U.S. mail. For only five bucks, you can take a vacation on the beach whenever you want. If you want to buy one, click on this link. We have bulk pricing if you order more than one video. Captain 149 lost his weight by limiting his calorie intake and exercising three times a week. That’s it. No two hour fasts with a tablespoon of olive oil. No silly powders or mixes. He just kept his calories below his expenditure and he lost weight. It works every time. The hard part is following the program. Chris was motivated to be healthy and was able to get back to a healthy weight and lifestyle. You can do it do. All you need to do is DECIDE to do it, no matter what. I buy a bottle of water at the gas station and quickly empty it because the warm sun has made me thirsty this season. Is it safe to refill it? What about washing it in the dishwasher? Will that make it leach carcinogenic compounds into my water like that email from my mom said it would? Should I just recycle it after its designated one-time use? The idea that carcinogens leached into water bottles from the plastic they were made of was the basis of a study that was flawed and hadn’t gone through peer review before the media snapped it up. If there is no risk of cancer, what about bacteria? There IS a risk of bacteria and germs with water bottles that are reused. The study referenced above was performed on water bottles from taken from 75 elementary school students, however. If you regularly wash your hands and bottles, you’re probably safer than most. I’m from the school of “A Little Dirt Won’t Hurt,” but I realize that is probably not the best recommendation I could make to people. Can you reuse a water bottle without getting cancer? Yes. Can you get sick from it? Maybe. Should you worry so much about it that you’re washing the bottle with a bottle brush after each use? If you do, just buy a new bottle of water. It’s not worth the hassle if you’re going to be scared of getting diseases with each sip. For me, I’ll keep reusing the Gatorade bottles and washing them in the dishwasher. If I contract a horrible disease, I’ll keep you updated. Are you tempted by exercise gadgets? Do they help motivate you to do your workout? For how long do they usually motivate you until you lose interest in them? Has there been any gadget that has REALLY worked for you and kept you motivated for a long time? Schedule It In: When I worked two full time jobs, I treated my exercise time like an appointment. I needed to schedule my other plans around it. It really is an appointment with yourself. Keeping it will make your day go smoother because exercise can give you a peace of mind that is hard to obtain otherwise. Get It Done Early: I liked to do my exercise first thing in the morning because then my “duty” was complete and I didn’t have to worry about it the rest of the day. I know this doesn’t work for everyone, but it worked for me. Pack As Much Intensity Into A Short Workout: If you only have 20 minutes for your workout, make sure you’re working at the highest intensity that you can during that time. If you usually walk a certain distance in forty minutes, set a goal to do the same amount in your 20 minute workout. You might not be able to achieve it, but you will pack as much benefit into those 20 minutes as you can. Be Flexible: A workout doesn’t have to be forty minutes at the gym. It can be a 15-minute walk for your morning break, a 20-minute walk at lunchtime and a five minute stretching session right before bed. Be on the lookout for ways to exercise when you have a couple of minutes to spare. “I’m too busy” is a common excuse that we give when we don’t really want to workout, but it’s just an excuse. If you are using that excuse right now, take a half hour and a piece of paper and write out all your feelings about exercise. You may find that you have other negative feelings about exercise that are interfering with your motivation. Until you move past those, you’ll never feel like you have enough time, no matter how many tips you follow. I received an email from the makers of the Aquaclip asking if I would like to review them on my website. They sent me some Aquaclips for evaluation and I was excited to receive them in the mail. When they came, I vowed to try the Aquaclip for an entire day, carrying my water around with me everywhere I went. That lasted for less than ten minutes. I walked out to the car, tried to sit down and the Aquaclip got in the way of my seatbelt, so off it went. I clipped it to my purse and that’s where it stayed until I got home and abandoned it on the counter. It stayed clipped to my purse pretty well, but not nearly as well as just throwing the bottle in the purse. I guess the problem is, I’m not a “tucker.” I don’t tuck my shirts into my pants, so I really don’t have an exposed waistband or belt to hold an Aquaclip easily. It feels weird if I pull my shirt over the bottle and just as weird to have it pulled around it. Having water at my waist was uncomfortable for me, so the Aquaclip isn’t my thing. I was worried that the Aquaclip would get in the way of drinking from the bottle, but it doesn’t. It works wonderfully as far as that is concerned. I was also worried that the bottle would jiggle around or fall off, but it didn’t fall off my waist or my purse the entire time I used it. It worked exactly how it is supposed to work, I just don’t want water on my waist. Mike, however, really liked the Aquaclip. He’s not a “tucker” either, but he didn’t mind having his t-shirt pulled aside. He used the Aquaclip while running on the treadmill and he said it worked beautifully for him. He also found three places on the treadmill where he could hang his water bottle using the Aquaclip. He immediately took it outside to see if it would work in the car for a drink holder. 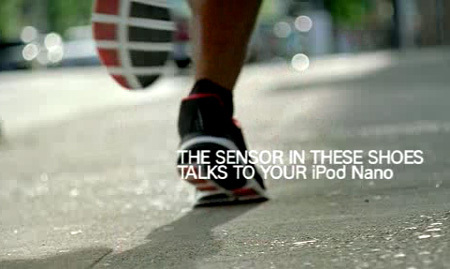 Cool Hunting got a hold of screen shots and a bunch more information about the Nike+iPod. The software IS a web-based program that syncs to the nikeplus.com website. You can get the input on your iPod screen. No word on whether you can turn off the voice response or not. It looks like you don’t have to wear Nike shoes for it to work, you just need to figure out how to put the sensor in your shoes. I tried the pre-order again and it works now, but you HAVE to buy the shoes in order to buy the NikePlus kit. One-hundred bucks is just too much for a pair of running shoes. It doesn’t look like Nike is charging a monthly fee to track your workouts online, but there is nothing that says that they don’t. You can eat anything you want. You just can’t eat EVERYTHING you want. You can eat anything you want and still lose weight. You just can’t eat everything you want. You couldn’t even eat EVERYTHING you wanted if you tried. Believe me, I tried. No matter how much I ate, I still wanted to eat more. Since I can never satisfy my bingeing, it doesn’t matter that I eat light now. I didn’t feel satisfied when I tried to eat everything, so there’s no point in trying that again. How do I eat anything I want and still lose weight? 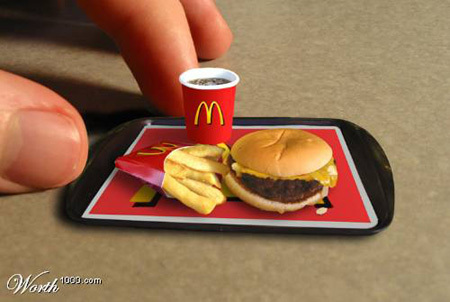 PORTION CONTROL. If I want a Big Mac, I get a Big Mac and I eat a quarter of it. That was unheard of for me before I started eating healthy. If I ordered a Big Mac, I ate the whole thing, even if two bites filled me up. I was so disconnected from my body that I never knew when to stop. Now, I eat a few bites and leave it at that. I can buy myself another Big Mac if I’m hungry in two hours. They’re cheap. Sometimes I eat two bites and bring the rest home. I eat a couple of bites for a snack later and the rest for dinner. Sometimes I don’t even need to eat it. Sometimes knowing that I can have carrot cake and it’s in the fridge for me is enough. Sometimes just buying the dessert is just as fulfilling as eating it ever was. If it really works the way the commercial says it works, then Nike and iPod are freakin’ geniuses. Seeing this commercial actually made me want to go on a run. Here’s how it works: A $29 sensor is placed in the sensor pocket in the sole of your $100 Nike shoes. The sensor communicates with a receiver that attaches to your iPod. During your run, you are able to check your pace, distance and time of workout using your iPod. They call it the Nike+iPod Sport Kit. 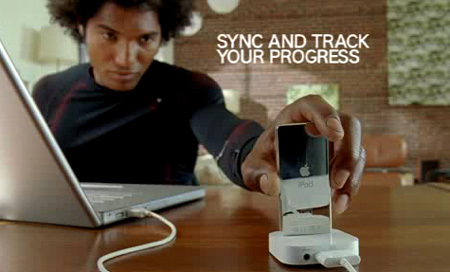 After your run, you can sync your iPod up with your computer, tracking the distance, pace and time of your run. Can I put that sensor in my RYKA shoes? They fit me better, don’t give me blisters and don’t announce to the world that I spent too much money on my shoes. Will there be a version of this that I can just tie to the shoe laces of my own running shoes or are you going to force me to buy your shoes to use this? When I check my time, pace or distance, does it give me the information in audio form like the commercial shows, or is it on the screen of my iPod? Can I turn off the audio if I want to? When I sync to the computer, will it be with a software program on my computer or is it going to be some stupid web-based thing where I have to be hooked up to Nike’s website in order to track my progress? Can I choose? What is the software like? Is it like that dorky screen animation that the commercial showed or was that just for show? Can I print up my workouts and progress charts? The Nike website is a little broken. It provides a link where you can pre-order the Air Zoom shoes and iPod Sport Kit, but when I clicked over to pre-order it, the website just said it was currently out of stock and wouldn’t allow me to do my pre-order. They dropped the ball on the whole “pre-order” idea. I really like this idea, but I want more information. For thirty bucks, I was willing to order it basically site unseen, but their website foiled that sale. I guess I’ll see it when it actually becomes available. Via: Reader submission – Matthew Strebe at SlashNOT!